When and how did you become a U2 fan? In 1988. I had always liked some of their songs growing up, especially Pride (In the Name of Love) – the first U2 song I learnt the words to – and With Or Without You, but became a huge fan when the Rattle and Hum album and movie came out. I saw the movie many times at the cinema. I then started going mad on buying all the back catalogue, merchandise and collectibles that I could get my hands on with my pocket money. 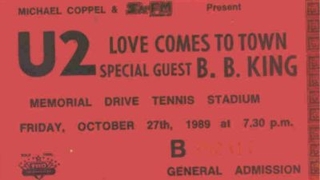 A ticket for the October 27 show in 1989. When did you first see the band play live? October 27, 1989, on the Lovetown Tour in Adelaide at Memorial Drive. Still one of the best days/nights of my life. Everything from the whole day of queuing up, the support act BB King to the U2 show was just an incredible and fun experience and we were in the second row in front of the stage. Bono fell off the stage right in front of us during one of the first songs and we all panicked, but luckily he recovered quickly. Can you list which U2 shows you’ve seen over the years? Adelaide, October 28, 1989. I was not inside, but watched the whole show for free from outside through the side gate at Memorial Drive. Bono even waved to us during the show. Sydney, November 26, 1993. This was the show when Adam was absent. Watching U2 live is a special experience, not just because of the show, but the people you meet. Tell us a little bit about the friendships you’ve made because of U2. I have met many great people along the way and made some very good friends out of it, especially during the Popmart and 360 tours and also the show I saw in Los Angeles in 2005. When U2 tour Australia, a group of us who have known each other for years always meet up in the different states, so not only do we get to share the awesome shows and possibly meet the band together, but it is also a great social experience as we hang out together in concert lines, stay at each others’ homes sometimes and go out for dinner/drinks etc. We also have catch ups with the local U2 crew when we can. I have also traveled to places that I never would have gone to for U2 shows (and to Dublin). You have met all of the band members. Can you take us through what that was like? Yes, I have met Bono quite a few times now. He has been awesome every time and is very friendly and accommodating. I first met him in Adelaide and it was on my 21st birthday, which was very special and quite a surprise. I met him inside The Hyatt where the band was staying (during the Zoomerang tour in 1993), as was I and some friends for my 21st. It was only myself and a friend and nobody else around so there was no frenzy of other people. Bono and his security guard were coming out of the elevator as we were about to go in. I was so stunned when I saw him and so nervous when he came over to us (as I was wearing a U2 Propaganda T-shirt) that I stuck out my left hand for him to shake instead of the right, but he squeezed my hand anyway and was very friendly, then left for the sound check. I don’t remember too much of the conversation as I was so star struck, but I remember my heart was beating really fast. U2 making headlines Down Under. Anissa photobombs before photobombing was even a thing. 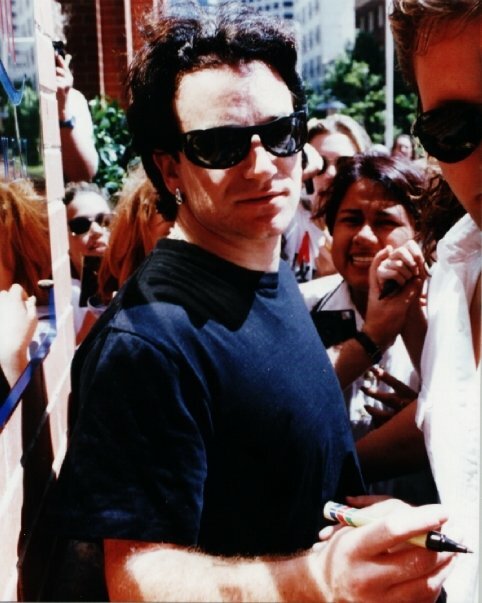 Anissa over Bono’s right shoulder during the hustle and bustle of the Zoomerang tour in 1993. I also met Bono again the following week in Sydney when he came outside of the Quay West apartments to greet fans, which was also the day of the televised Zoo TV show and he assured fans Adam was feeling much better and would be performing that evening. 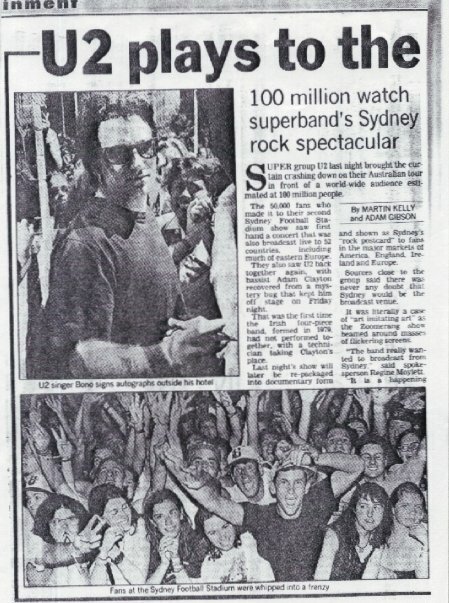 I found out a year or so later that I was in a photo that was published in a Sydney newspaper standing behind Bono, though it is not that clear. I met all four band members at once when they came outside of The Hyatt in Melbourne in 1998 prior to the band leaving for the Popmart show in the afternoon. There was a very long line of people waiting for them, but they took their time in signing autographs and posing for photos. This was the first and only time I ever met Larry, but I have a photo with him from that time which I treasure. Not long after that photo was taken a girl annoyed Larry and he rightfully walked off and got into his car, so quite a few missed out on meeting him. I waited for hours with a group of U2 fans outside the Red event at the Sydney Opera House on November 30, 2010. All of us fans who had waited hours for them were practically crushed in the process when a load of non-fans came at the last minute and got in our way, even the police were powerless with so many people all at once. We were all a bit disappointed that after waiting many hours, we were shoved aside by people who clearly were not U2 fans but just there for the sake of it. I did get a few photos of Bono at least. Adam was there too, but got in his car immediately and we didn’t see Larry or The Edge. I also met Bono and The Edge in Sydney outside of ANZ Stadium on the afternoon of December 14, 2010. They both got out of their cars and stopped to greet waiting fans. Bono spent ages chatting and signing and U2.com made a clip of it for the site. 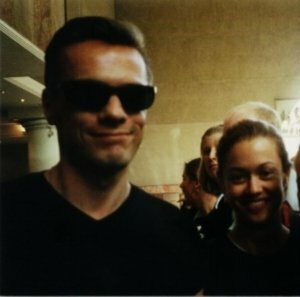 Anissa’s treasured photo with Larry Mullen Jr during the Australian leg of the Popmart tour in 1998. Were there any particular moments that really stand out in your mind when you met them? The first time I met Bono was really special being my 21st birthday and nobody else was around and we were not rushed. I could not have asked for a better present and it made up for the bad seats we had. It was also memorable meeting Larry in Melbourne as he is usually quite elusive, but he was really friendly, chatted and posed for a photo with me when my friend asked if he would (I thought he would say no, but he didn’t). All of the band are really friendly though, but also very different personality wise. 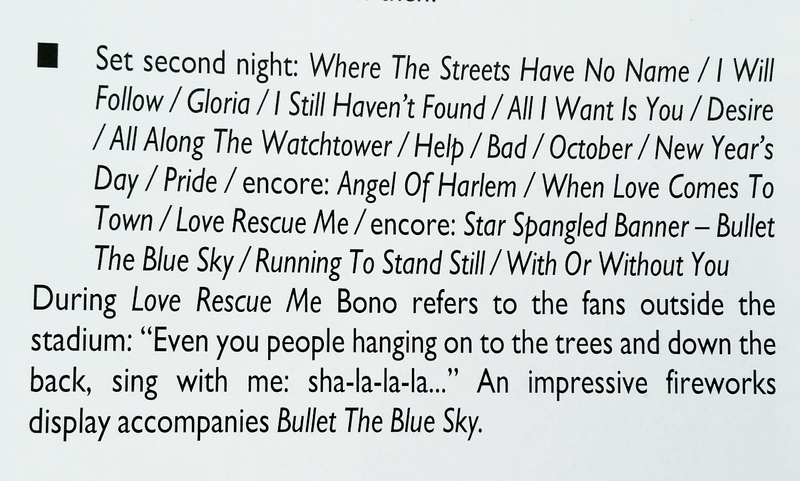 You are one of the few people who can say you were Bono’s neighbour. How did that happen and what was it like? I lived in Dublin on a ‘working holiday’ during the summer and autumn of 1999. I was looking for a short-term rental close to the city, but was not having much luck. I saw an ad in the evening newspaper one night for a six-month house share arrangement in Killiney which is a beautiful area near the beach and was around the right amount of time I wanted a place for. I went to look at the house and I could not believe how close it was to Bono’s, though the house was a small cottage and was a fraction of the size of his. Luckily, I got the place and so I was Bono’s neighbour for that summer and part of the autumn. You don’t see Bono out walking or on the beach like you would hope though. Only saw him in his car a few times driving near my house. There were always people camped outside his house and a security guard was always present at the gates or inside of them. When you say neighbour, how far apart were the properties? About a three minute walk. There were not too many houses in that area at that time, but he would have been one of the closer ones for sure, though Bono tends to be away a lot. There were a few other celebrities’ homes in the area at the time including Enya (she lived in a castle) and Damon Hill the racing car driver. 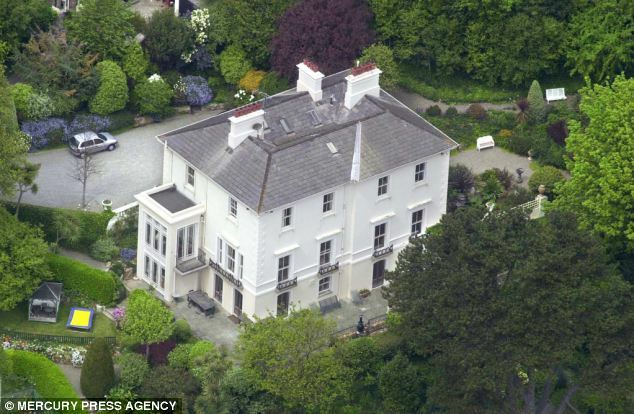 The Edge’s home was not too far away either in the neighbouring suburb of Dalkey. Did you ever see any of the Hewsons say, take out the trash, or play loud music until the wee small hours? Ha ha! No, never saw any of them out doing the domestic chores. One Friday night in the summer there was a party on at their house though. I got off the train late at night and heard a bit of music coming from up the hill where the Hewsons lived (but not too loud)and their house was completely lit up with really bright white flood lights. Living next to Bono gave you a small insight into what it would be like to be famous. Can you tell us the pros and cons? I certainly was given an insight as to what it would be like to be a celebrity, and not all good. There are always people outside his house, even when it rained and pretty much anytime of the day and night just waiting for him. I lived there when their eldest son Elijah was born so after his birth was announced in the news there were even more fans than usual waiting outside. I often used to go for walks as it is a really beautiful scenic area or I would walk to the shop for groceries and fans would pounce on me when I walked past his house and ask me all sorts of questions (eg: if I knew him and did I know if he was at home or in town? etc). I saw things from Bono’s perspective and that you would never have any sort of privacy and, unlike me, he probably could never just go for a walk around the neighborhood. The U2 iPod. Anissa still has hers in its original box. (The one pictured above is not Anissa’s). You’ve collected U2 memorabilia since 1988. What are some of your favourite items in the collection? Can you give us some background about them? I used to go to the record import stores quite often and also to record fairs for the rare collectibles. I also worked in the music industry in the early days of being a U2 fan so always could get stuff quite easily and find out in advance when U2 material was going to be released. Ask anyone who knows me and they will tell you about the big Joshua Tree framed glass picture that I bought in 1988 and the lengths I go to to keep it from getting damaged. It is one of my most treasured possessions and every time I move house, the removalists are instructed to take extra special care of that framed picture – or else! I also have an autographed photo of Larry that I got in the late 1980s after writing a fan letter to Principal Management (yes, I am a Larry fan) and also my signed Popmart tour book which has Larry, The Edge and Adam’s autographs from when I met them in Melbourne. Sadly, it is missing Bono’s autograph in it though, but both of those are pretty special to me as well. I have vinyl singles and albums, calendars, photos, posters, books and still have my VHS collections. 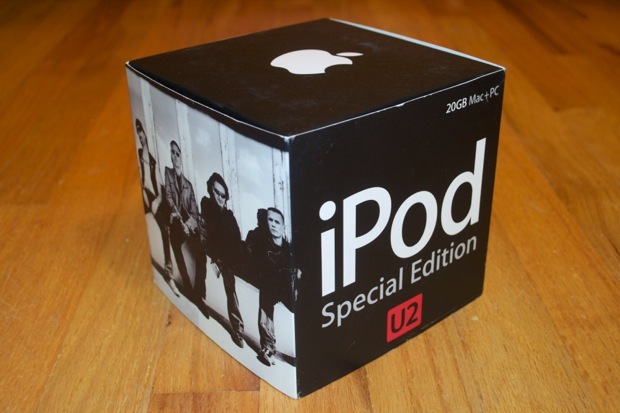 I also have the U2 iPod, which I have never used and is in mint condition still in the box. It is all special to me and I could never part with any of it, even if I have a double up of things. That’s a hard one. There are way too many to choose from, but probably In God’s Country would rank up there at the top. The Joshua Tree without a doubt. Check out my U2 Australia Facebook , Twitter and Instagram pages.